Obituary for June Evelyn (Robertson) Stephenson | Providence Funeral Homes & Crematorium Inc. It is with great sadness that we the family announce the passing of June Evelyn Stephenson, formerly of Fort St. John, BC. June left us suddenly on Wednesday, July 18, 2018 in Summerland, BC at the age of 86 years. June was born June 28, 1932 in Macklin, SK to Bruce and Mary Robertson. She married Wilfred Harry Stephenson June 28, 1952 in Kerrobert, SK. In 1963 they moved to Fort St. John, BC with their two children Calvin and Colette. For many years June worked as bookkeeper and desk clerk at the Fort Hotel, then later at the Condill Hotel until retirement. A few of her favourite hobbies included sewing, bowling, and bingo. She enjoyed card night twice a week and morning coffee with her many friends, often bringing muffins or cinnamon buns she had baked. June was a great cook and baker; she loved to make people happy with her cooking. It was homemade, melt in your mouth, comfort food. June was predeceased by her parents, sister Emily Deets, and husband Wilfred of 39 years. She is survived by children Calvin Stephenson and Colette Campbell; grandchildren Cindy (Wade) Baker, Wesley (Julie) Stephenson, Wade Pustanyk, Tara Bardal (Nick), and Cale Campbell (Kaija); and great grandchildren Dalten, Cole and Adryanna Baker, Elaina, Hunter, and Emma Pustanyk, and Jackson and Scarlett Stephenson. 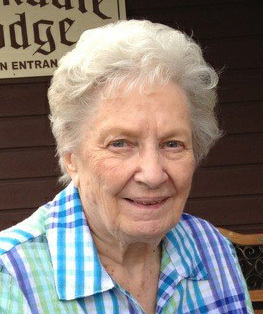 June will be fondly remembered for her kindness, her witty sense of humor and laughter, and her love for her family. She will be dearly missed. June’s Celebration of Life will be held on Thursday, August 30, 2018 at 2:00 p.m. at Peace Lutheran Church in Fort St. John, BC with Pastor Kabate officiating. Interment will follow at Woodlawn Cemetery. A reception will take place in the banquet room of Peace Lutheran Church. In lieu of flowers, expressions of sympathy may be made to North Peace Seniors Housing Society, 101-9816 108 Ave., Fort St. John, BC V1J 5S4.